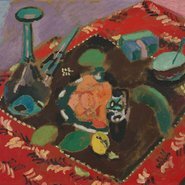 In 1948, a brave curator inaugurated a new era for the Hermitage by rescuing the modern French art bought by Moscow merchants in Tsarist times and bringing some of the most daring canvases to Leningrad. Drawing on Russian sources, Rosamund Bartlett will discuss the fate of the Hermitage’s modern masters in the context of the museum’s turbulent history, beginning with Catherine the Great’s lust for art collecting in the 18th century and extending to the present day. Henri Matisse Dishes and fruit on a red and black carpet 1906 (detail), The State Hermitage Museum, St Petersburg.